What do you do when you set up shop at a Rebel base on the Ice World Hoth? Easy. You put on a brown anorak. The thick polar jacket is sure to keep you warm in the inhospitable climate of Hoth, and the fur-lined hood will help keep your face warm when you've got it flipped up. And the brown color will look great with your blaster belt! Okay, okay. We know what you're thinking. You're thinking, "This is a Han Solo jacket. It looks just like Han's jacket from Empire Strikes Back. But I thought he had a blue coat!?" Well, you're right. And you're wrong. You see, due to the postproduction color grading of the film, the coat appeared navy blue on screen, although, in reality, it was indeed brown. Which means this anorak is a match! 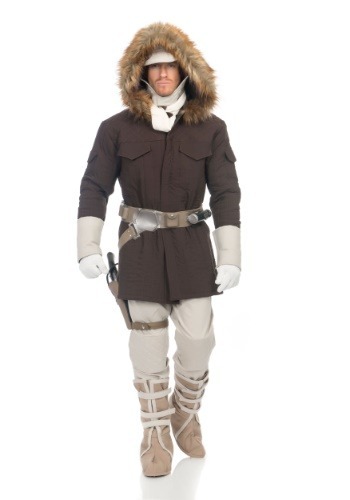 This costume set not only includes the iconic jacket that Han Solo wore, but it also comes with pants, mukluk style boot covers, and all the other standard-issue Rebel gear to recreate the look from when he was on the ice world in Star War The Empire Strikes Back. The hat, gloves, wrist cuffs, scarf, and soft molded belt are all replicas items that add depth and detail to this elite costume. Take this costume for a spin on Halloween, or recreate your favorite scenes in perfect character cosplay. Just remember to give your friends a snarky "Then I'll see you in hell!" when they tell you you'll never make it past the first marker!